Is it impossible to pin down both where and when an event takes place, due to quantum gravity effects? Shahn Majid explains why this may be. In these posts I have emphasized ideas on the cutting edge of fundamental science which have testable predictions or other contact with experiment, rather than being merely fashionable. 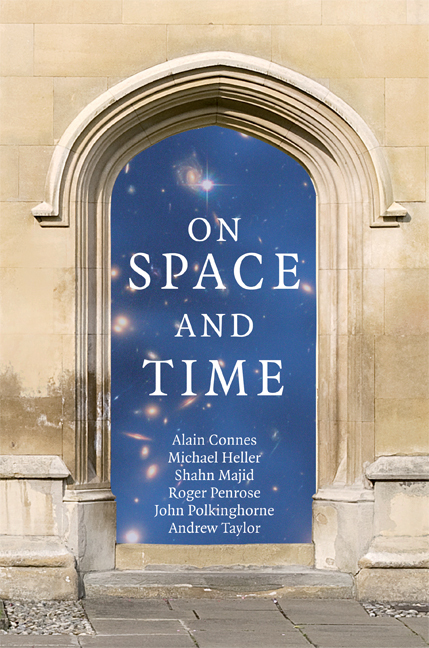 Now, up until recently it was widely assumed that ideas for the ‘Mount Everest’ challenge of quantum gravity, as Martin Rees puts it in his review of the multiauthored book On Space and Time, could never be tested experimentally. Accordingly, theoretical physicists in the last two decades have often given up on serious experimental contact and based their ideas on fashion or ‘elegance’. This, unfortunately, is not by itself a reliable indicator as it rather depends on what maths you are familiar with, something which tends to be rather hit and miss in the theoretical physics community. I consequently agree with Martin Rees that we are nowhere near the ‘summit’ as it were. This was pretty shocking for me and for most of my colleagues (including my string theory colleagues) because a theory has to be judged by how it goes beyond what is known, not by the mere wish to succeed. It’s no doubt tough being on the radio and probably the interviewee was trying too hard to oversimplify, but it illustrates the problem. I should say that I am not against string theory per se, though I do agree with those who say that it should be judged in perspective and not to the exclusion of other approaches. Thus, quantum gravity, whatever it is, must in some limiting approximation, recover ordinary gravity in the form of curved space time. Now, as we step away from this limit we must have corrections to geometry that begin, for the first time, to include quantum effects. The problem with this is that you need first of all to have new mathematics — a new more general notion of geometry itself — within which to cast such possible effects. You can’t describe effects involving colour if you can only see in black and white. So what we need in the first instance is a new more imaginative conception of geometry itself. …where L is potentially a constant of Nature. If the effect is due to quantum gravity we might expect L=10-44 seconds for reasons explained a few posts ago. Here i is the square root of -1 as last week, and x, y, z, in this model behave like ordinary numbers among themselves, so that xy=yx etc. 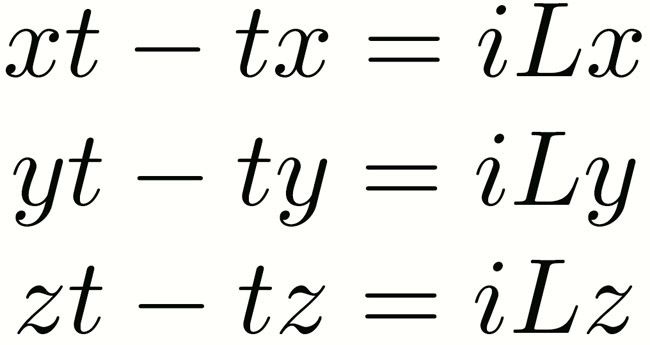 It is the t variable that behaves in a funny way as shown. This time it’s not graffiti, (at least, I haven’t carved it anywhere!) but something proposed in my paper with the physicist Henri Ruegg in 1994. 1. A particle or an event cannot be exactly located in both space and time. So if you look at your watch and then immediately look where you are, you will typically get a different answer than if you had first looked where you are and then at your watch. The error is not great, maybe about 0.00000000000000000000000000000000000000000001 seconds. This is a different from Heisenberg’s famous uncertainty principle but has a similar flavour. 2. The speed of light depends a bit on the energy. Blue light travels just a very very tiny bit slower than red light. This is in sharp contract to the cornerstone of Einstein’s theory that the speed of light is a fundamental constant. There has been speculation that the first effect might be detected as increased ‘noise’ in certain highly sensitive experiments that could be done today. But let’s look at the second effect. Some time next year NASA will launch LISA, an interferometer designed to detect gravitational waves in space. This instrument is so sensitive that it could in principle be retooled to also test for the variable speed of light effect. I’m told that this would only cost a few million euro, compared to the 5 billion spent on the LHC. 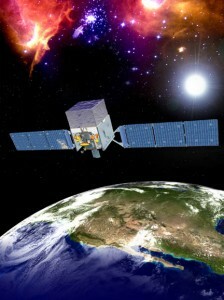 Another experiment that IS being done uses the NASA FERMI (GLAST) satellite which went up earlier this year. The original acronym stands for gamma-ray large area space telescope; it detects gamma rays — a very energetic form of light — that are created in massive bursts often on the other side of the Universe. These create a spread of energies and according to the theory the more energetic ones would arrive a little more slowly. When you put the numbers in, the difference is about a 1/1000 th of a second which is quite reasonable. Life is not quite as easy as that, however, as we have no control over these bursts on the other side of the Universe, so this effect if present would show up only after statistical analysis of a great many such measurements. Collection of such ‘time of flight’ data is part of the mission protocol and could either confirm or disprove the theory. If quantum spacetime is confirmed in this way, it would be a huge discovery in a certain sense dual (I may try to explain this next week) to the discovery of gravity itself. Clearly, these are exciting times for fundamental physics!